A non-running air conditioner during peak summer heat almost snuffs the life out of you. Problems in the functioning of the air conditioner can manifest in many ways. One of these is non –running outdoor unit. In such conditions you will find that the indoor unit is running as it does. But the outdoor unit is almost dead. Before you call the AC repair technician to bail you out of this misery, do a bit of troubleshooting yourself. You may be able to identify the fault and repair it too. •	Check if the thermostat has been set in cooling mode. Also check if it is working and batteries have not run out. •	Also check if the indoor unit is running properly. Do this by feeling the air that is being blown out of the vents. The fault lies in the fan motor or there is a bad capacitor. As the compressor is running, 220 volts of power is being supplied to it by the contractor. The contractor also supplies power to the motor. So the contractor and compressor are fine. You have to check two things now the capacitor and the fan motor. The former can be checked with a multi-meter that has the ability to read micro farads. 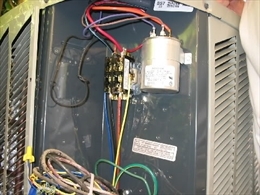 If you are not quite comfortable about testing electrical devices take out the parts (capacitor and the fan motor) and take them to nearby HVAC Repair Company. If you want to test the capacitor yourself, do so by turning off the air conditioner. Remember, capacitors can store an electric charge (like a battery). Discharge the capacitor by shorting between capacitor terminals with a screwdriver. Now remove the wires from the terminals. Set the multi meter meter to read above 10k and 1m ohms. Connect the leads of the multi meter to the corresponding leads on the capacitor, red to positive and black to negative. The meter should start at zero and then moving slowly toward infinity. If it is doing so it is fine. Otherwise it is faulty and needs to be replaced. •	The blades may not be moving at all. This could be caused by worn fan bearings. Turn off the A/c. Take a stick and to push the blades of the fan with it. . If they spin freely, the bearings are fine. But you will need a new motor. •	Check if the contractor switch is pulled in. If it is pulled in, but the motor does not start then the motor is completely damaged. If you hear a humming sound from the motor and the fan also starts when given a manual push the capacitor has become faulty. •	A fan may also be running at a too low speed. This can happen due to low voltage. This could be also due to circuit failure in the condenser unit. Also check for power to the fan. It could be just running out of the breeze. Inspect the state of the motor shaft and the fan belt. If they are worn they should be replaced. A slow condenser fan can be the result of a non-working capacitor and a burned-out compressor motor. 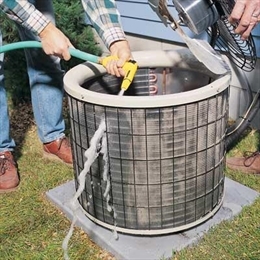 It can be caused due to tripped breaker or a blown fuse in the condenser unit. Over current in the compressor can also cause the fan to run slow. •	Check if the fan is balanced in position and there is no obstruction that could hinder the movement of the blades. Also check if the blades are not bent. If they are slightly bent, they can be set right at home. Otherwise they need to be replaced. If they are wobbling secure them tightly in place. Fans with bent blades will stress the motor and damage it. •	Check if the blades of the fan are not broken. In this case the fan can come loose from the shaft. It moves on the shaft but the shaft is unable to move the motor. The motor could be damaged in that case. It could be due to failure of the contactor. You can check the contractor with a multi meter. If multi-meter reads 220 volts going in, zero volts coming out, and 24 volts across the coil terminals, then the contractor is bad. If the contractor is fine the problem lies with compressor. Call HVAC technician to get it tested. Repairing or replacing a compressor is quite expensive. Disclaimer: Disclaimer: Although these are the typical methods used to troubleshoot a non-working condenser unit, they can vary from place. Please consult the professional service provider as the details are for information purposes.